Cody Sanderson is the associate head coach of the Penn State wrestling program. He is the older brother of Penn State head coach and Olympic gold medalist Cael Sanderson. Cody served as the wrestling coach for Frank Molinaro of the U.S. team at the 2016 Olympic Games in Rio de Janeiro, Brazil. Molinaro took fourth place at the games. 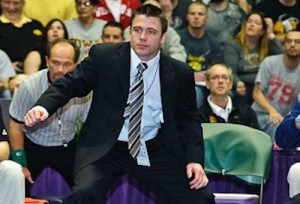 Before coming to Penn State, Sanderson was associate head coach at Iowa State. As head coach at Utah Valley University (then Utah Valley State College), he created the wrestling program in 2003. Sanderson earned his bachelor’s degree in psychology with a pre-medicine curriculum from Iowa State in 2000. He was an administrative assistant there from 2001 to 2003. He was born on August 8, 1976, in Heber City, Utah. He and his wife, Sarah, are the parents of three children. He is a member of The Church of Jesus Christ of Latter-day Saints. This page was last edited on 29 December 2016, at 14:41.